I saw „The curious case of Benjamin Button”. After ending the movie I stood up and went out to see my love. I wanted to spend some seconds with her, to simply see her, enjoy her presence, enjoy the moment. She was in a different mood, coming from the kindergarten where she left the children. She had a lot of thoughts, she wanted to tell me many things. I was listening her staying connected to my wish to be present to the moment, to me and her. But all the subjects she was speaking about were interesting and distracting me from beeing present to me, her. 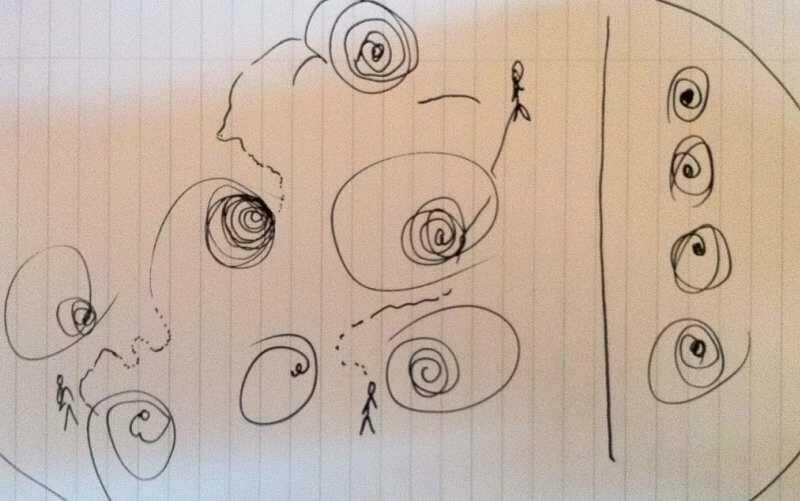 I started to visualize me flying among spirals. Each subject she was telling me was like a spiral who could catch me and start a lot of thoughts in my mind. Keeping me away of my self, keeping me blocked in thoughts, in the noise my mind sometimes makes. Cool visualization of this …issue we’re all having. Never imagined it this way, I guess it will help me in the future when I stumble upon another spiral, especially a downward one.